Well, not quite... Some of you may be wondering this morning why, if oil posted its largest gain ever yesterday and closed at $120/barrel sending the markets into a tailspin, crude is quoted at $107.60, down $1.81/barrel. Yesterday's price action was the most cut and dry example of speculation in the commodities markets we have seen to date. 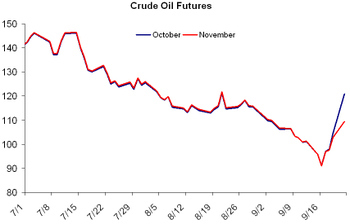 Contracts for October delivery expired yesterday, meaning anyone who was short those contracts would either have to cover their short or deliver the oil. A $25 spike was the result of hasty short covering before the market closed. I have always been fascinated about how the oil market works. I'm starting to believe more and more that, in fact, it has no rules to be obeyed.